This is the original text of an article first published in Vertigo magazine, spring 2002. During the past five years the cinematographic or videographic expressions which have found their way into the art galleries, biennials and other events around the world show a radical difference from what has gone before, from the experiments of film’s avant-garde artists such as Anger, Connor, Deren, Sharits and Snow to the video installations of the artistic avant-garde, of Nauman, Hill, and Viola. Film or video pieces by young artists such as Pierre Huyghe, Douglas Gordon, Sharon Lockhart, Pierre Bismuth, Mark Lewis, Georgina Starr, Matthew Barney, Stan Douglas or Sam Taylor-Wood are primarily imitations of the cinema or of its mode of production. These works consume the whole of cinema, “le tout de cinema” as the Austrian critic, Alexander Horwath, puts it; they do not distinguish between high and low art, nor are they concerned with cinephilia. My comments are not intended to undervalue these works. On the contrary, they are perfect examples of the strategies of imitation inherent in the way young artists from all over the world produce art in general. They imitate a wide range of western visual expression, avant-garde techniques and, inevitably, the cinema. They look for disciplines which are readily available to anyone, anywhere. Of all the arts, it is the cinema which functions as a really global medium. That cinema which is globally popular did not and does not seem to be bound by different cultural characteristics and art was looking for that. Significantly, many young artists are responding to existing forms of mimesis in cinema itself. So we can now speak of a secondary mimesis, which is becoming recognisable in films made by visual artists. Through this process they also become aware of the visual and linguistic limitations of their own discipline in comparison with “real” cinema. Consequently they re-assert their profession and skills as visual artists. Cinema involves immense technical control, which undeniably results in very high production values. The artists can also compensate for the lack of audience for visual art by inventing their own sympathetic and participatory audience, and making it physically present. Four chairs imitate a movie theatre in order to reinvent the presence of a sympathetic public. Here also, secondary mimesis plays a part. After the era of the cinémathèque, television preserved the memory of old films. In the same way, the video recorder – that sedentary journey undertaken by many artists – now offers a way to preserve the memory of the cinema of the ’60s, ’70s and ’80s. As the French film critic Dominique Paini puts it, video is also responsible for the “mise en ruine” of the cinema, meaning that fragments of a movie culture are scattered around and then brought together again. This fragmented way of looking has affected cinema in such a way that a new form of cinema has evolved. Responding to the words and works of Antonin Artaud, the artist Mark Lewis chooses to call this a kind of tertiary cinema. French theoreticians and artists’ film advocates Raymond Bellour and Jacques Ranciere, likewise speak of’ “un autre cinéma”, another kind of cinema indeed. It is neither experimental nor classic. Cynically speaking, it is a cinema which can be defined by the idea that everybody wants to make a movie and to be part of the process. It is cinema as a new kind of solidarity movement for young artists nostalgic for the good times at art school and other alternative spaces. The question posed by the famous film theoretician Andre Bazin, “Qu’est ce le cinéma?” [what is cinema?] 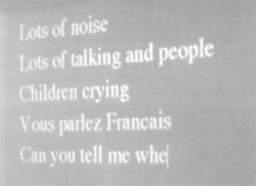 now seems less relevant than the question “Ou est le cinéma?” [where is cinema?]. The answer is everywhere, including, of course, the art museums and galleries. Perhaps the art gallery reveals the way to bring cinema through to its next phase, in relation both to what and to how things can be shown: that is to say film as a live experience, with multiple projectors, TV screens, computer monitors, cameras, editing units, communication networks, all set in highly diversified spaces, obliging the users to restructure the conventional space of the movie theatre. Imagine that huge, black box which the experimental film prophet, Hartman Biopsy, dreams of, within which many different things can move, where things can be altered and exchanged in both real and virtual time. Things can also go badly wrong, as Doug Aitkin and Chris Cunningham have proved in recent installations; in general such phenomena strengthen the notion that cinema is primarily a dramatic medium rather than a narrative dictatorship. What we want to see are so-called pure images in other constellations. Perhaps that is also how one can explain our admiration for “other” movies (the other cinema), often much slower, coming from Iran or Asia, or for artists’ films made by well-travelled westerners such as Tacita Dean, Steve McQueen or Antri Salad. Perhaps these filmmakers still deliver pure images. Belonging to the same realm as our desire for pure images is our easy rejection of soundtrack and dialogue, and our acceptance even of the fact that film does not need to be projected in front of rows of chairs, or in entirely darkened spaces. As Jeff Wall states, we now need a certain kind of emptiness, and we want to structure that emptiness ourselves. If need be, we would even give up our chairs, the soundtrack and the darkness. Therefore one might say that cinema today is exhibited, just like photographs. These projected images and info-pixels, often accompanied by oceanic, ambient music or rapid techno beats, consume the viewer’s time-log, to such a point that some museums have to consider the need to hand out return tickets. The flier from Bill Viola’s exhibition at the LA County Museum read: “As some of the works on view may extend over several hours of time, you may request a free return pass”. 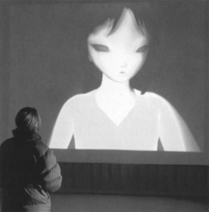 Many art galleries now realise that the use of large, illuminated photo-boxes, slide projections which are fading in and out, looped film projections, multiple video projections on automatic repeat, or interactive computers linked to the internet has liberated their exhibition spaces from the illusion of the static world. Things we generally associate with the visual arts suddenly start to move on a large scale. Or should we say that suddenly we have become aware that there are static images? As a result of the new applications of photography, cinema and video, we can now really reflect in our museums on what stillness is. From Jeff Wall’s point of view, the stillness of still pictures has become very different, otherwise one couldn’t explain the current fascination with still photography. In addition, it is cinema which liberated photography from the rather highbrow, orthodox theories of photography and their relation to painting. Photography has renewed itself as an art form through the reflection of, the mediation of, and the explanation of, precisely, cinematography. Jeff Wall goes so far as to state that his photography is one of the possible outcomes of cinema as we know it. Probably the most exciting thoughts in this context come from the Viennese theoretician Roger Buerger, when he refers to Giorgio Sagamen’s Notes on Gesture – because the most important element of cinema is the gesture, not the image. Gesture is the exhibition of mediatility/mediation/middleness. Gesture sits right between ethos and politics, that which is neither means nor end. In the gallery cinema brings back the gesture, because the exhibition of cinema raises once again the question of the autonomy of the spectator. This idea connects Buergel to Foucault’s notion of the crisis of government, and the metaphor of self-direction and self-organisation. Maybe cinema in the museum can teach us to organise ourselves again. 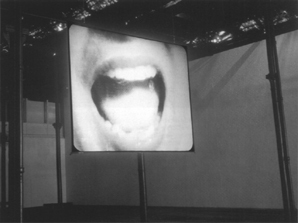 Buergel connects this to the political/poetic work as well as the spatial projection arrangements of artists such as Olivier Zabat, Rainer Oldendorf and Harun Farocki. Perhaps this is what we also become aware of when we see those miniaturised series of movements in the work of artists such as Fiona Tan, Jeroen de Rijke, Willem de Rooij and David Claerbout. Their work also reminds us of the fact that there is no real movement in cinema: it is a succession of photographs. As the French critic Serge Daney has suggested, one dimension of the trick of cinema consists of holding on photos not quite long enough. Paradoxically, many movies by artists today seem to bring the image to a stop. Above all, their work requires a renewed attention to an archaeology of time. Not surprisingly, these movies become related again to the perception of painting, because, as the English film critic Michael O’Pray points out, their temporal frame does not in fact differ so much from the spatial frame of painting. These film projections are not organised entities, but only a constellation of margins and boundaries, where beginning and end are not conditioned or conditional, but merely random. 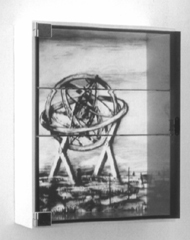 The transformation of the film projector into the video-beam causes the projected image to change slowly into a real, flat plane just like the painting. I guess this might also be one of the reasons that good old Bill Viola’s work fits so well into our picture galleries. Isn’t the public’s fascination with Viola just a fascination with the perception of time? The word ‘museum’ seems to be associated with daylight, whereas the cinema presupposes a dark room. From the beginning, however, the museum claimed to be a universal museum. Such a space has to reflect both day and night, so there need to be dark rooms in a museum. Maybe we’ll have to think of the solar and the lunar departments of the museum? If movement was the project of the 20th century, it is reasonable to assume that there might be a project to follow. This project has to be growth, which is where intellectual gurus such as Rem Koolhaas and Bruce Mau think cinema in its purest sense as an ordering of temporal events, will be left behind, along with other cultural expressions. Growth is the capacity for an organism to incorporate. In this way what we are witnessing today is the outcome of the digital information age, the beginnings of engagement in techniques of growth. Roger Buergel, “Arbeiten an den Grenzendes Realen”, Texte zur Kunst no. 43, September 2000. Edwin Carols, “About the Un-dead”, Cahier no. 5, 1996. Hal Foster, The Archive without the Museum no. 77, October 1996. Alexander Horwath and others, “Movie Mutations: Accounts from the ’60s” Trafic no. 24, winter 1997. Mark Lewis in conversation with Jeff Wall, transcript, vol. 3, no. 3, 1999. Sven Lutticken, “Static Cinema”, FROM no. 4, 2001. Dominique Paini “The Return of the Flaneur”, Art Press no. 255, March 2000. Jacques Ranciere, “L’autre cinema”, Cahiers du Cinema no. 552, December 2000. Jeff Wall, Hartmut Bitomsky, Raymond Bellour, Edwin Carols and others in my documentary Still/A Novel, produced by VPRO, Hilversum in 1996. Chris Dercon was formerly the director of the Boijmans Museum in Rotterdam, where he contributed regularly to the International Film Festival. He has taught film and video in Leuven, Paris and Brussels, and is now director of the Haus der Kunst Munich.